What Has Become of My Puerto Rico Now That the Storm Has Passed? That shock began on September 20, the day Hurricane Maria made landfall in Puerto Rico. Robles recalls watching from afar as the island was devastated by a category 4 storm. Two weeks later, his mother was among the thousands who left Puerto Rico to escape the dire conditions. Much of the first episode is dedicated to her experience, which Robles narrates in a sober yet vulnerable tone as the sounds of Harlem echo in the background. The next episode, released a week later, picks up where the first leaves off, albeit with more of Robles’ perspective on current events. A public relations faux pas by the First Lady of Puerto Rico, for example, was a fixture of the news cycle. The New York Times had also reported on a severe mental health crisis in Puerto Rico, evidenced by the overwhelming number of calls to a suicide prevention center in San Juan. Mainly, however, Robles reflects on the traditional holiday season in Puerto Rico, which had persisted despite the somber mood and bleak circumstances. Here is where Catatonia is most effective, as Robles chooses to engage with a broader audience by providing enough context for anyone to understand exactly how the joyous character of a Puerto Rican holiday season has been stifled by Hurricane Maria. Yet while cultural sensitivity is an ideal component of the podcast, it is not the only way to navigate the aftermath of a disaster. To that end, outside sources are also important reference points for Robles. Having traveled to Haiti in 2011 to document the destruction there as a result of a massive earthquake, Robles is aware of similar cataclysms around the world that have taken place in recent years. He cites Josh Neufeld’s A.D.: New Orleans After the Deluge, a non-fiction graphic novel on post-Katrina New Orleans; and Richard Lloyd Parry’s Ghosts of the Tsunami: Death and Life in Japan’s Disaster Zone, an account of the 2011 earthquake and tsunami in Japan; as two examples of this research into the post-disaster condition. In general, the format of Catatonia continues to evolve. The third and fourth episodes include excerpts of a candid, two-part conversation with photographer Joseph Rodriguez—in addition to a pensive musical theme and smoother transitions between segments. Rodriguez spent two weeks on assignment in Puerto Rico for the New York Times in October. There, he attempted to document the destruction, traveling outside of the capital of San Juan to places like Caguas, which happens to be Robles’ hometown. The trip, he goes on to explain, also coincided with a larger project called Puerto Rico Lament. Even before Hurricane Maria, Rodriguez had been seeking to create a visual archive of the island in the same way American photographer Jack Delano famously did in the 20th century. Representation, moreover, is one of the many issues faced by Puerto Rico to which the photographer offers a strong opinion. The fifth and last episode to be released thus far is also the first to include interviews in Spanish. In early March, Robles attended the 7th annual New Art Dealers Alliance (NADA) Art Fair in New York City to speak with members of Brigada Puerta de Tierra. Rather than to promote and sell artwork, the grassroots artist collective was there on behalf of the neighborhood in Old San Juan that it supports through its initiatives. Robles once again acts as intermediary, briefly recapping the conversation, and injecting some of his own commentary in between segments. 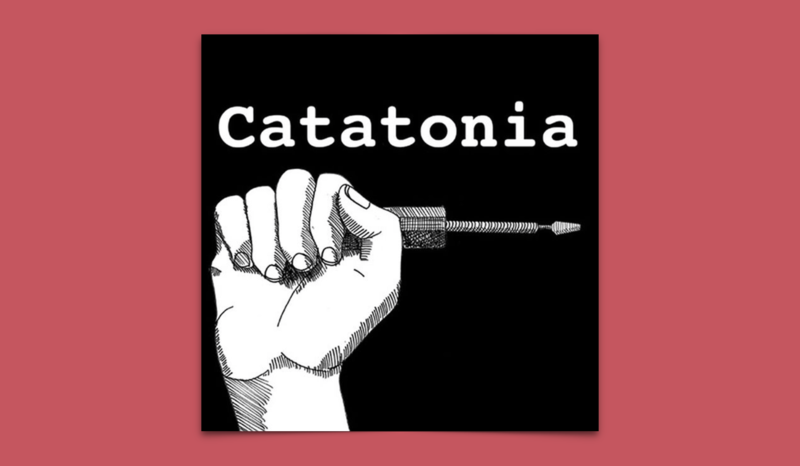 Ultimately, Catatonia is a podcast that invites the listener to participate in a collective effort to understand and process the trauma of what has happened in Puerto Rico, what is still happening, and the uncertain reckoning that lies ahead. The episodes are short, accessible. And with Robles as host, they ease back and forth, between English and Spanish, catharsis and exposition—a work in progress with fortunately no end in sight. Néstor David Pastor is a writer and musician from Queens, NY.